Prose. delivers a social platform for the creation and consumption of literature in a completely censorship-free environment. Navigating Prose. on the iPhone is a snap with the sidebar menu panel. The Internet has made all manner of creative expression possible, such as personal blogs, tweets, Facebook posts, and YouTube videos. But modern communication methods are can be impersonal or entirely too personal, depending on the platform being used. For writers, social networking is a conundrum: Elegant prose is often lost in the deafening roar of a million cat videos, first-world problems, and other mindless chatter — or worse yet, completely ignored because the author failed to find an audience in the first place. Surely there must be some kind of middle ground, a platform designed for readers and writers alike to share their love of the written word free of advertising, social noise, and content restrictions. If this sounds like your kind of place, read on. No matter what you’re into, Prose. offers something for everyone, free from censorship as well as advertising. Prose. 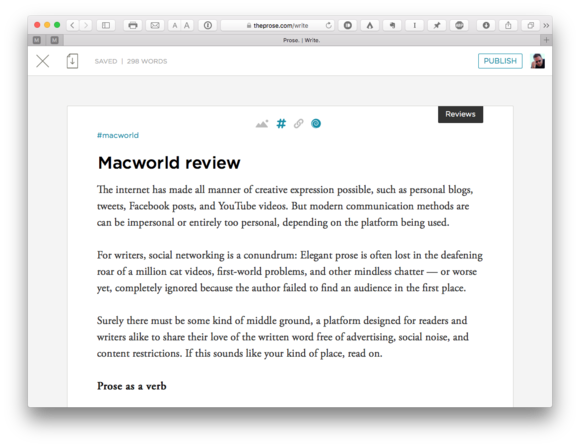 allows anyone to be an author and publish on the go from anywhere using an iPhone or web app. The service is absolutely free and free of advertising of any kind, with writers retaining 100 percent copyright over original content. The concept is to “break out of the fast-paced, mindless click-and-scroll conventions” of social networking we’ve fallen victim to. That’s not to say Prose. turns its back on social; posts can still be bookmarked, reposted, commented upon, or shared like other social media apps. The difference is how Prose. caters to two distinct but overlapping audience types. The first is Read, where users explore content, discover authors, participate in challenges (some with cash prizes), and subscribe to portals they’re interested in, with categories like Poetry & Free Verse, Long-Form Prose, Reviews, Haiku, or Sci-Fi. 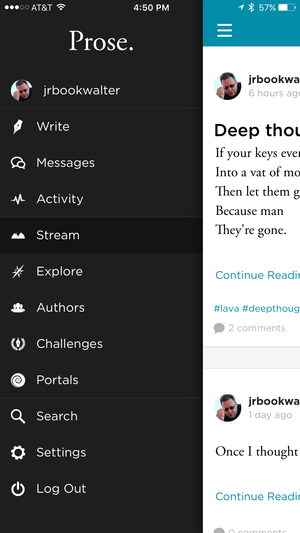 If you’re also a writer, any content you’ve contributed appears in the Stream menu. Here you can see how many readers have viewed, bookmarked, and reposted, as well as comments which appear below the post. 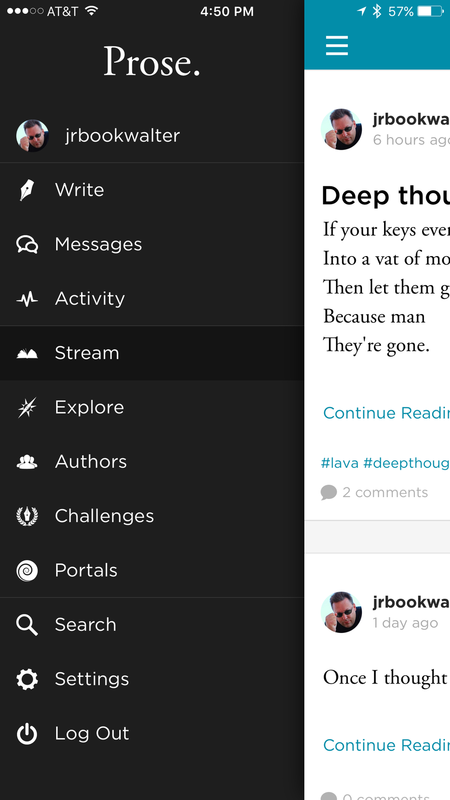 On the web app, there are sharing buttons for Twitter, Facebook, and email, but Prose. uses the built-in iOS 9 action extension on iPhone. The iPhone app offers a separate preview mode where authors can add a header image, hashtags, links, or assign a portal. The second mode, Write, provides a clean, distraction-free environment for authors. Posts are written in an elegant serif font, but can include an optional title in bold, sans-serif type. There are no options to change or import other fonts, but the apps include options for bold, italics, or underline styling. Posts can optionally include a single imported header photo, but there’s not a great deal of control over formatting aside from vertical positioning. There are also options for assigning hashtags, attaching links, and selecting which portal the work will appear. Just be sure to do this before publishing, because there’s no way to attach links or edit the portal later on. I found the web app best suited for these enhancements, since the iPhone app can only do them in preview mode. Very often I’d get everything just the way I liked it, only to lose some or all embellishments after navigating back to write mode. By comparison, all changes take place on the same screen from the web app. Because Prose. is cloud-based, writers can start typing on iPhone, save as a draft, then load it into the web app and pick up where they left off from a browser on any device with changes saved automatically. Once everything is to your satisfaction, click the Publish button and your post is shared immediately with other Prose. members. On the web, Prose. offers a clean, distraction-free workspace for writing in just about any form you’d like. Although the Prose. 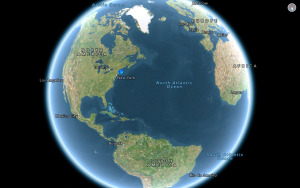 apps work well, I found the lack of a native iPad app a curious omission. This is particularly true for iPad Pro owners like myself, who now have access to large, luxurious software and hardware keyboards that allow our fingers to really let loose. 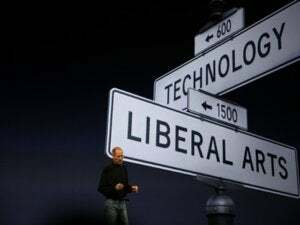 Thankfully, the web app works in a pinch with Mobile Safari, although if you log in with a Facebook or Twitter account, you may need to tweak or disable any installed content blockers first. (1Blocker caused my login to hang until I deactivated it.) You can also sign up with email or username to circumvent this problem. Likewise, the lack of native Mac and Windows apps also feels like a lost opportunity since the web app can’t be used offline, and the iPhone app isn’t comfortable for long-form writing without a Bluetooth keyboard. 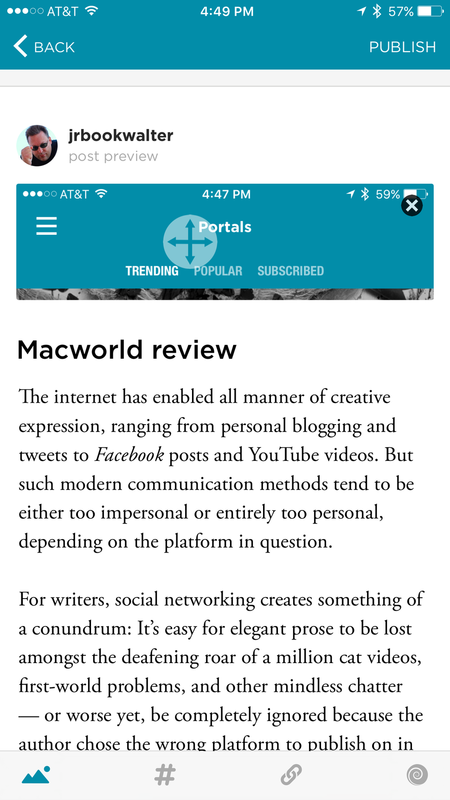 These quibbles aside, I appreciate the simplicity of the existing apps, which keep the focus on your prose. The one thing Prose. currently lacks is privacy. Aside from draft mode, there’s no way to publish posts only you can see, or those intended for a specific group of users. To be fair, this is in keeping with the general manifesto of “meaningful interaction” for all, but those accustomed to Facebook’s granular control over the audience for each post will be disappointed. Prose. 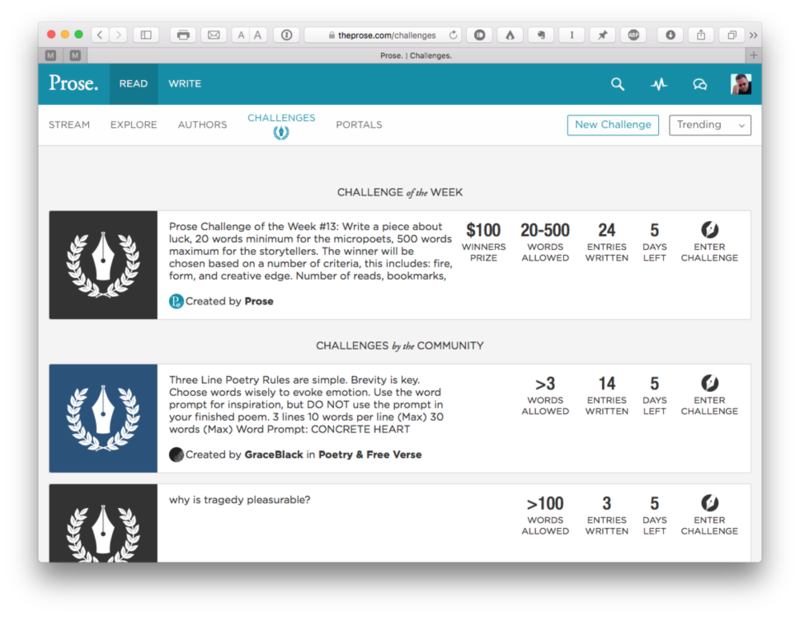 users can challenge each other, and the service occasionally offers cash prizes to reward good writing as well. Assuming you don’t mind sharing everything with other users, Prose. is the perfect middle ground for writers, falling somewhere between blogging and the cacophony of social networking. Prose delivers a social platform for the creation and consumption of literature in a completely censorship-free environment.